Over the past year, the FEWA Credentialing Committee has worked diligently to improve the CFLC application process and ensure only those qualified receive the distinction of the credential. The Credentialing Committee has designed a CFLC Exam which will cover the the duties and responsibilities of providing forensic consulting and expert witness services in litigation claims in a core program consisting of nine distinct areas of study known as the "Core Program." Beginning November 1, 2018, the CFLC Exam will be a mandatory application requirement for those seeking the credential AND for current CFLC seeking recertification. Learn more about the exam and application requirements. Join us TODAY for a webinar that is FREE TO ALL to learn “How to Make the Most of Your Membership! 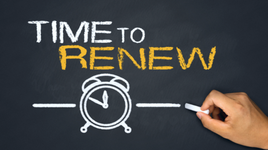 It’s Almost Time to Renew Your FEWA Membership for 2019! At FEWA you become part of a community of experts which allow you to stay current on topics which can impact how and why you do your business. Additionally FEWA provides its members with the opportunity to better understand some of the inner workings as an expert. Being an Expert Witness can be an exciting way to utilize the years of experience you have in your industry and being better prepared for the process can reap many long-term benefits for you. Your FEWA family is always there to help answer questions and guide you. You will be receiving a paper renewal notice in the mail soon and the opportunity to renew online will be made available. Ever wonder who is on the other end of the phone when you call the FEWA National Office? Learn who is responsible for what, and who you can contact if you have any questions. 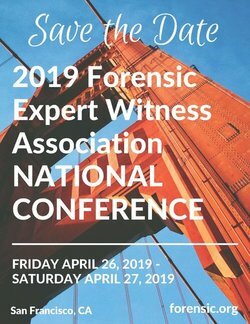 Attorneys, legal professionals, and expert witnesses gather annually for the Forensic Expert Witness Association (FEWA) National Conference - the Conference for Experts in all fields and of all experience levels. Previous research has indicated that particular traits of the expert witness can affect their credibility in the eyes of the jury, however most of this research has been undertaken using mock jurors. In contrast, this study investigated the perceptions of real jurors. In particular, the research focused on the juror’s perception of the forensic scientists’ expertise and credibility during testimony in homicide cases. Events from the U.S. Supreme Court confirmation hearings to the rise of the #MeToo movement have brought child abuse, both sexual and non-sexual, out of the shadows. Still, decades-old allegations are often difficult to prove and may hinge on the memories of the people involved. What if there was a physical record of abuse stored in the body that could be analyzed scientifically? Over the years, considerable technological development toward DNA typing in the bid to identify genetic markers has been undertaken. However, minimal efforts have been devoted to the determination of the end of the process. This is despite the fact that the procedure of DNA collection and recovery remains the most critical in the process of DNA analysis. Almost all assays demand sufficient amount of DNA both quantitatively and qualitatively. So, the success of DNA typing depends on the availability of existing DNA templates. Better methods are required to recover DNA, especially when addressing the most challenged samples such as touch DNA. As Fitbit forensics become more common, this criminal defense attorney wonders how people seeking to mislead police will profit. Since 2013, Florida has been the center of a battle over admissibility standards for expert witness testimony. Toxicologist and scientist with expertise in risk assessment, mathematical modeling, statistics, neuroscience, and ecological health. 10+ years at the EPA. 15+ years of teaching and extensive public speaking. Consulting and expert witness experience with alcohol, DUI and dram shop issues, environmental risk, illegal drugs, pharmaceuticals, accidental poisoning, and intellectual property.